PuntSeq; a toolbox and workflow to facilitate realtime monitoring of algal, bacterial and viral diversity in aquatic field work situations. The PuntSeq team were awarded an OpenPlant Fund grant to develop a toolbox and workflow to facilitate realtime monitoring of algal, bacterial and viral diversity in aquatic field work situations. We caught up with them to find out how the project is progressing. Full details of the project can be found on the biomaker.org website. Year by year, Cambridge rowers, swimmers and punters obtain serious infections associated with pathogens obtained from the Cam river’s water. While an information and research framework that targets the involved microbial culprits is still lacking, our project PuntSeq is a citizen science effort that will provide an in-depth resolution of the Cam river pathogen landscape - with minimum expense! 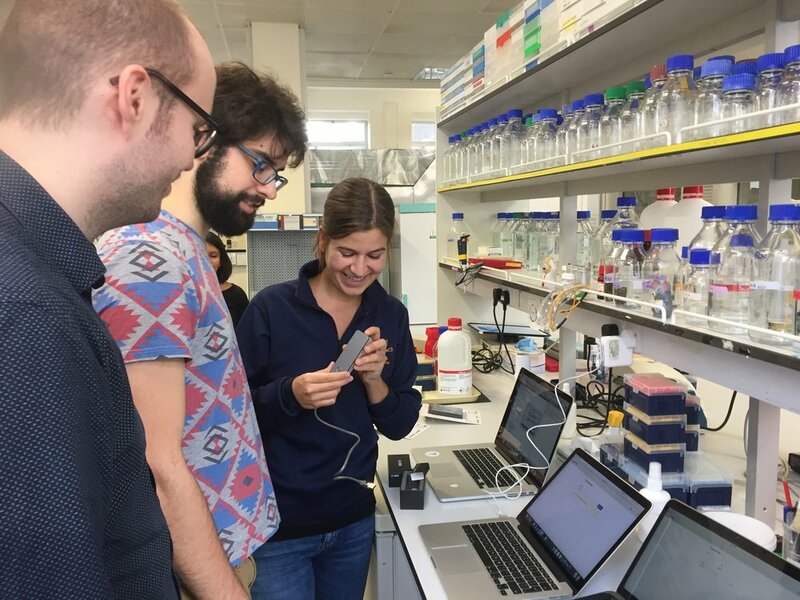 Led by a small group of graduate students at different Life Science Departments of the University of Cambridge, we have designed a workflow for the hand-sized Oxford Nanopore MinIONTM DNA sequencing device. We are adapting software for processing large volumes of biological data from different spots of the Cam, and try to match our bacterial findings with physical measurements of the same water samples. A do-it-yourself Arduino station that combines signals from pH, temperature, turbidity and other sensors will ultimately help us understand how certain pathogens prefer to reside within particular environmental locations of the Cam. We regularly communicate our efforts and findings through Twitter (@puntseq) and presentations at scientific conferences. Moreover, a video featuring our research ideas is also currently being produced in collaboration with Wolfson College, Cambridge. Over the past years, we learned about sections of the river where people appear to often catch infections, by regularly talking to rowers and swimmers in frequent contact with the Cam. Despite the general knowledge of these unsafe areas of our river, the actual cause of the infection (i.e. the bacterial strain) remains unclear in many cases. Up to now, taking a snapshot of the bacterial population living in a water body has required a laboratory with expensive equipment. Compared to previous sequencing machines, the Oxford Nanopore MinION dramatically reduces running expenses and is also very small, which makes it an ideal instrument for fieldwork applications. For us, this offers the opportunity to explore a new technology as well as to work interdisciplinarily by diving into a whole set of different fields from electrical engineering (Arduino measuring tool), to environmental research and the vision of personalised, data-driven health care. How did the team meet? Most of our members have known each other through their PhDs and previous degrees at Cambridge University. Many of us have worked together in other research projects and we share a passion for genomics research and citizen science. With an interdisciplinary combination of expertise in conservation biology, bioinformatics, engineering and physics, in situ sequencing of the Cam appeared as a really cool project for all of us to join in! How has this project developed links between Cambridge and Norwich? Our PuntSeq team started a collaboration with Prof. Rob Field’s laboratory at the John Innes Centre (JIC), Norwich. Amongst other environmental phenomenon, the Field lab studies algal blooms of the haptophyte Prymnesium parvum that has been associated with mass die-offs of fish in the Norfolk Broads. While the lab succeeded in associating the toxic algal blooms with infection of P. parvum by the DNA-virus PpDNAV (Wagstaff et al., 2017, Viruses), a quick monitoring system has been lacking. Here, PuntSeq’s aim of establishing a fast metagenomics surveillance of water sources fit in perfectly. Two of our team members attended the Norfolk Broads stakeholder meeting of 2018, where we learned more about the algal blooms, exchanged our experience with DNA extraction methodology, and presented our own project of assessing the microbial community of the Cam. At this meeting, we started a collaboration with members of Rob Field’s lab to test if our approach was applicable to monitor the presence of P. parvum and PpDNAV in water in a cheap and fast manner. We hence combined our knowledge in DNA sequencing using the MinION technology, in subsequent data analysis and in engineering of environmental measurement tools to perform a metagenomics analysis on a sample of Norfolk’s Hickling Broad. As a preliminary result, we were able to draw a map of the bacterial and fungal community of the Broad, and we found a species of the toxic algae and also evidence of the virus. Through our public outreach on Twitter and by regularly featuring our project at different events, we were able to discuss PuntSeq with peers and leaders in the field, for example to Prof. Nick Loman whose lab has been using the MinION to track the 2015 Ebola outbreak. 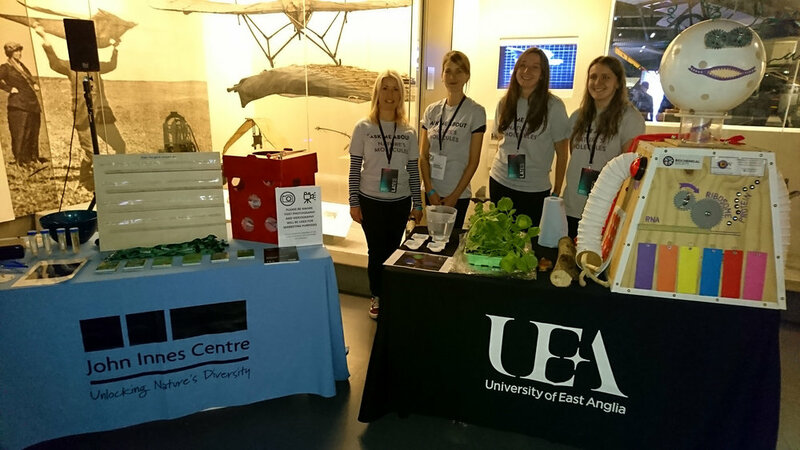 We received very positive feedback and useful advice from members of the Field lab at the JIC and colleagues at the University of East Anglia (Dr Ben Wagstaff (JIC), Dr Jennifer Pratscher (UEA), Mr Elliot Brooks UEA) as well as from Alina Ham from Oxford Nanopore Technologies, which have already resulted in improvements to our DNA extraction and sequencing workflow. Apart from this very well-received general interest in our project, we really enjoyed seeing that our first proper MinION run with the sample from the Norfolk Broads worked out - and that the results nicely confirmed our approach. What is the biggest challenge the team have faced? Is there something that came out of the project that you never expected at the beginning? A working DNA extraction protocol, a working MinION and a working Arduino platform! How has the OpenPlant Fund enabled the development of the project? Through the generous funding of the OpenPlant grant, we have been able to purchase the MinION starter kit for $1000, different water DNA extraction kits, basic lab equipment and our set of Arduino sensors and wires. Moreover, Dr Colette Matthewman and Dr Jenny Molloy from OpenPlant have kindly brought us in touch with algal expert Dr. Ben Wagstaff, helping us to establish an ideal Cambridge-Norwich collaboration which will help us immensely in expanding the applicability of our approach to algal contamination of freshwater waterways. The Fund's excellent outreach network has helped us in amplifying results and messages of our project through social media channels, mainly via twitter, in addition to their kind provision of facilities for a MinION metagenome sequencing workshop that we will hold in Cambridge very soon. Since our PuntSeq project received its first financial funding around half a year ago, it has progressed very quickly. In these few months, our team has been able to learn about all steps that are necessary to perform metagenomics surveillance analyses, from environmental measurements over DNA extraction and MinION sequencing to bioinformatic post-processing of the data. Hereby, it is great to see how much we have learned from each other, but also entirely from scratch by reading subject literature, talking to experts and simply by trial and error. We are now at a stage where we have optimised all individual protocols to perform a major water sampling and sequencing effort at various locations of our river Cam. We expect to be able to provide a profound overview of the microbial community of the Cam by the end of Spring. Overall, our outreach activities have been very successful although we did not present much data yet. Both scientific and non-scientific communities have shown strong interest in our project, we received a lot of positive feedback, won multiple best-poster-prizes at conferences and motivated many people to follow our progresses via Twitter (@puntseq). We are confident that this already large interest will further increase with our first results about the river Cam being released, and we are currently strengthening our public engagement efforts, e.g. by taking part in events like “A Pint of Science”, by producing a professional movie clip and conducting an online-survey on infection rates through direct contact with the Cam. We founded PuntSeq to inform the general public about the merits of DNA sequencing, especially about the direct impact it might have on peoples' health. In future, we would ideally like to sample from multiple rivers of the greater Cambridgeshire area and beyond, producing a map of microbial communities along the length of respective waterway trajectories. We hope to share our findings with relevant environmental authorities in Cambridge and East Anglia, and to influence environmental conservation through genomics. Our team is also further streamlining the process from extraction of the aquatic DNA to sequencing with the MinION and automatic identification of potential pathogens in the field, so that non-specialists can perform these experiments and gain a deep insight into the beautiful science of microbiology. PuntSeq team members are: Mr Maximilian Stammnitz (Department of Veterinary Medicine, University of Cambridge); Ms Meltem Gürel (Cancer Research UK Cambridge Institute); Dr Philipp Braeuninger-Weimer (Centre of Advanced Photonics and Electronics, University of Cambridge); Mr Daniel Elías Martin-Herranz (European Bioinformatics Institute); Mr Daniel Kunz (Wellcome Trust Sanger Institute); Mr Christian Schwall (Sainsbury Laboratory, University of Cambridge); Ms Lara Urban (European Bioinformatics Institute); Mr Jack Monahan (European Bioinformatics Institute); Ms Surangi Perera (Department of Physiology, Development and Neuroscience, University of Cambridge); Ms Eirini Vamva (Department of Medicine, University of Cambridge); Ms Astrid Wendler (Department of Clinical Neuroscience, University of Cambridge). Dr Deborah Scott and Dr Dominic Berry of the Engineering Life project (The University of Edinburgh) have published a report "Genetic resources in the age of the Nagoya Protocol and gene/genome synthesis", based on the results of an interdisciplinary workshop held in Cambridge and involving several OpenPlant colleagues and part-funded throught the OpenPlant Fund. The workshop was dedicated to exploring emerging questions and discussions around the practice of synthesising DNA in the context of global biological diversity use and regulation, in relation to the Nagoya Protocol. Map showing parties to the Nagoya Protocol and Biological Diversity Convention. Image by L. Tak, CC BY-SA 4.0. Researchers in law, synthetic biology, social science and history were brought together to consider the implications of the Nagoya Protocol for Synthetic Biology and modern biotechnology. The report summarises the presentations and discussions that took place, including conversations on drivers and implications of ABS legislation, and benefit sharing and proprietary technologies. The latter half of the report reflects on the workshop in light of the December 2016 UN Biodiversity Convention, and considers similarities and differences in the deliberations addressed at the two events. The report ‘serves to highlight issues not yet addressed in formal negotiations and to provide additional texture to conversations already underway’. In March 2017, Dr Colette Matthewman joined participants from industry, civil society, funding bodies and academia for an Industrial Dialogue on Synthetic Biology as part of the EU-funded SMART.map project (http://projectsmartmap.eu). The workshop was held at the Manchester Institute of Biotechnology. The SMART.map project is developing RoadMAPs to Societal Mobilisation for the Advancement of Responsible Industrial Technologies. Its goal is to define and implement concrete roadmaps for the responsible development of technologies and services in three key time-changing fields: precision medicine, 3D printing in biomedicine and synthetic biology. The Manchester dialogue provided a framework for discussions on the challenges facing synthetic biology companies, especially in the area of responsible research and innovation (RRI) and the development of concepts for tools that could help industry to engage with and integrate RRI into their synthetic biology working practice more easily. Read more in this blog and the video below. The 5th edition of Co-Lab workshop was hosted in Cambridge, including Makespace Cambridge and Department of Plant Sciences at the University of Cambridge. This workshop received a grant from the OpenPlant Fund, with the aim to spur discussion of plant synthetic biology from an ethnographic point of view. The facilitator, Open Science School, is an non-profit based in Paris interested in exploration of open source technology in the fields of education, design and beyond. This is a guest post by Lena Asai from Open Science School. Follow her @LenaAsai! The workshop consisted of 3 ideation workshops and a ‘Big Making Days’ prototyping workshop with activities that bridges together artists, scientists and designers to brainstorm and work on an interdisciplinary project around synthetic biology and life engineering. The programme includes pigment extraction, making electricity with plants (hosted by Paolo Bombelli), Ethnography activity, and series of participatory lectures. VRICKS is a citizen science based project that aims to connect students and general public with science. Virology is the basic scientific direction of the project. 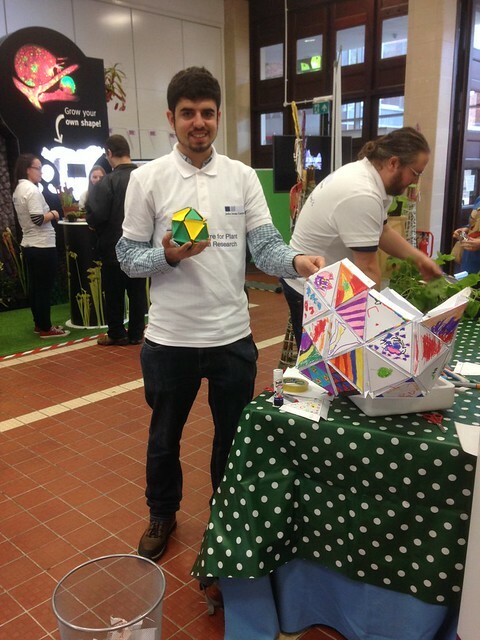 Researchers go to a classroom or science event, they pitch the project and the participants play, design and assemble viral structures using the VRICKS box. Participants upload pictures of the assembled structures in Twitter/Instagram. Researchers pick their favourite structure once a week and comment on it in the blog of the project. Additionally, researchers get inspired by the proposed structures and might even add new VRICKS to the collection. In the end, we have a citizen science project, which combines education, creative thinking and advanced research technologies. The edible book aims to present the traditional hardback book in a new light. The edible rice paper will add an additional layer of sensory experience to reading the book, whether for educational purposes aimed at young children, or for novelty purposes aimed at opening the minds of gift-givers, and even as an innovative medium for communicating food science principles, inside and outside the kitchen. Having the aim to investigate at the relationship of emotion and smells, this team utilised EEG scans to connect to sense of smell and person’s psyche. They sought to developing a framework, based on EEG and questionnaires, to elucidate these factors and to assemble a dictionary of smells, the reactions to which are most uniform and repeatable. Such a dictionary could have applications ranging from storytelling via an olfactory sequence of smell “snapshots” to mood control. The participants took full advantage of the facility at of Makespace, especially during the Big Making Days. It was a fantastic experience for the workshop, as Makespace Cambridge is such a wonderful space and the participants were very thankful for this opportunity. We were able to host over 20 participants to work on the ideas developed during the Brainstorming Weekends. We would like to thank Directors of the Makespace, Jenny, Carlos and all Makespace members for providing us with such an amazing experience. This workshop was supported by a grant received by OpenPlant, which allowed materials for participants to be fully funded. The workshop is part of EU project No. 709443. DITOs will implement many innovative participatory event formats across Europe focusing on the active involvement of citizens in two critical areas: the cutting edge topic of biodesign and the pressing area of environmental monitoring. The project will advance the EU Responsible Research and Innovation agenda by moving beyond more traditional approaches into direct engagement that builds upon DIY, grassroots, and frugal innovation initiatives so that in the short and medium term we sustain localised capacity building and in the long term the effects of these grassroots efforts channel into policy action at different levels. This project has received funding from the European Union’s Horizon 2020 research and innovation programme under grant agreement No 709443. Please see below and at the link information on a funding opportunity being offered by the Dutch government for international (Dutch-led) research projects focussing on safety in Syn Bio. The programme is open for international partners too (up to 40%), on the condition that the main applicant is a Dutch partner. "Biotechnology is a highly dynamic field of research, with new developments occurring at a rapid pace. New DNA base pairs, interdisciplinary collaboration, and targeted changes to the genetic make-up of humans, animals and plants are producing many opportunities for innovation. In this context, it is important that the safety of these future uses and applications of biotechnology remain assured. The Dutch Ministry of Infrastructure and the Environment has therefore commissioned the research programme ‘Towards Modernisation of Biotechnology and Safety’. The main goal of the programme is to build scientific knowledge concerning the risks and uncertainties associated with state-of-the art and future modern biotechnology developments and applications, as well as to gain knowledge on ways to minimise and control those risks. As research on innovations does not automatically take into account the risks associated with them, the aim of this Programme is to stimulate the integration of risk research into current and future innovations in the field of modern biotechnology. The Programme will generate knowledge that can be used to further refine and develop the risk assessment and risk management system." A matchmaking event is included in the process and will take place on 15 September. Details from Simon Hazelwood-Smith at Science Practice "We are Science Practice, a design and research company focused on applying the principles of design to science. One of our interests is in ways of increasing access to scientific testing in agriculture, and we are currently developing a paper microfluidic device for testing soil nutrients like nitrates, at Imperial College London. We also have a MinION (a pocket-sized genetic sequencing machine) from Oxford Nanopore and we would like to try using our last two MinION flow cells for agricultural testing. We are looking for a collaborator with lab access who would be interested in trying this out to see if we get any interesting results. Currently our plan is to test nitrates in two different soil samples with our microfluidic device, and also to use MinION sequencing to identify organisms (bacteria, fungi etc.) found in these two soil samples. The aim is to see if it is possible in principle to detect a relationship between nitrate levels and nitrogen-fixing bacteria. This little project would be about two days of lab time (1 day to sequence each soil sample). However we are open to suggestions for other agriculture (e.g. plant) related sequencing projects from anyone who is interested in exploring this exciting new piece of technology with us." If interested, please contact Jenny Molloy (jcm80@cam.ac.uk) for more information.